Posted on 12/7/2018, 4:52 pm, by kittykill, under Handmade Gift Ideas, Holidays. There is nothing better on a cold winter’s day than a warm cup of tea. It makes the body and soul happy. A Tea Wallet from Natalex is the perfect gift for those coworkers and friends who love to have a little cuppa during the day. Fill the wallet with different types of teas from traditional black to spicy herbal. 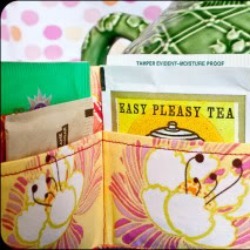 Pair the tea wallet with homemade truffles or scones for a tasty gift. From book club buddies to crazy coworkers; our Handmade Holiday Gift Guide has ideas for everyone in your life.